Sometimes the performance figures of a car are so astounding, they work better than any fancy word we can come up with to describe it. 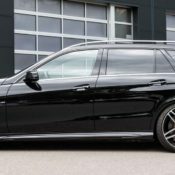 that is why we put those numbers right in the title of our post on the new G-Power Mercedes-AMG E63 S. Presented in estate (wagon) form here, this thing is an absolute monster. Well, maybe not a monster but a “wold in sheep’s clothing” as the tuner refers to it. The G-Power Mercedes-AMG E63 S looks pretty much stock on the outside, save for a set of really cool aftermarket wheels, and there is no way you can guess at its inner power just looking at it. I mean, you know it’s a powerful car because, after all, the stock E63 packs a very decent 585 horsepower. But you wouldn’t know this family station wagon is almost as powerful as something like a Koenigsegg and lots more powerful than any Lambo. As for how G-Power Mercedes-AMG E63 S got this much power, well, like we said the base engine was a good one with 585 factory horses already at its disposal. 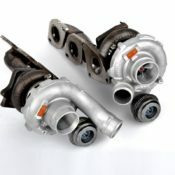 The technicians then went ahead and installed a pair of extensively modified turbochargers on the V8, fitted a stainless-steel exhaust system and steel downpipes, and managed the whole thing with a new performance-oriented software. 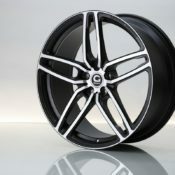 The result is a colossal 800 horsepower and 1,110 Nm of torque. This E63 can now sprint from 0 to 100 km/h in 3.1 seconds and, with the top speed limiter removed, top 340 km/h flat out. 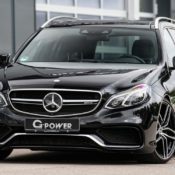 The post G-Power Mercedes-AMG E63 S Estate: 800 hp, 1,100 Nm! appeared first on Motorward.